(PhysOrg.com) -- Our Milky Way galaxy, like other spiral galaxies, has a disk with sweeping arms of stars, gas, and dust that curve around the galaxy like the arms of a huge pinwheel. The Sun, Earth, and solar system are located in a spur of material that lies between two of the spiral arms, collectively orbiting around the galaxy about 25,000 light-years from its center. Because the Milky Way contains copious amounts of dust that blocks our optical views, it is extremely difficult to study the galaxy from our vantage point within the disk. Thus the details of the spiral arms in our own galaxy are much less certain than is the structure of external spirals such as Andromeda, which is a few million light-years away but sits well above the plane of obscuring dust. Radio wavelengths can peer through the dust, however, and molecules like carbon monoxide that emit in the radio and concentrate in the galaxy's spiral arms are particularly good tracers of their structure. Using a small 1.2-meter radio telescope on the roof of their science building in Cambridge, CfA astronomers Tom Dame and Pat Thaddeus used carbon monoxide emission to search for evidence of spiral arms in the most distant parts of the galaxy, and discovered a large new spiral arm peppered with dense concentrations of molecular gas. 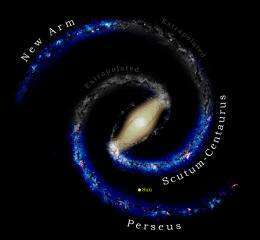 The CfA scientists suggest that the new spiral is the far end of the Scutum-Centaurus Arm, one of the two main spiral arms thought to originate from opposite ends of our galaxy's central bar (see figure). If their proposal is confirmed, it will demonstrate that the Milky Way has a striking symmetry, with the new arm being the symmetric counterpart of the nearby Perseus Arm. Well, it isn't really new... just new to us. And looking at it, our galaxy looks pretty puny when compared to Andromeda. She is going to EAT us!